The slim CuZn Itty-Bitty Travel Counter-Top Water Filter design assures you of instant, top-quality water wherever you go. It works with any faucet that has a removeable faucet aerator to filter all your water needs, providing you of the best possible water for drinking, washing, brushing teeth, etc. Using a combination of trace minerals (copper and zinc in the patented form of KDF which has been tested to NSF Standards 42 and 61) and coconut shell carbon, the Travel Filter removes or reduces hundreds of contaminants from water, including chlorine, lead, heavy metals, trihalomethanes, herbicides, and pesticides much the same as Mother Nature uses the earth and its minerals to cleanse water and unlike carbon-only filters, bacteria can't grow inside the bacteriostatic CuZn filters! The Travel Filter also features a post-filter that removes sediment down to 25 microns. Nothing is more important to our health than water, and clean water is the lifeline to sustaining good health. By total weight, our bodies are about 80% water. Water flushes impurities from our systems, regulates body temperature, and aids in digestion. Water restores the body fluids and quenches thirst better than anything else. Medical and nutritional experts agree we should drink at least six to eight glasses of water daily. 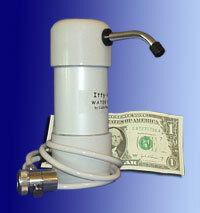 Use the CuZn Itty-Bitty Travel Counter-Top Water Filter on chlorinated water supplies. Turn on your faucet and pull the diverter for an uninterrupted supply of fresh, clear, filtered water. The Travel Filters diverter screws on to the end of the faucet. Because the Travel Filter combines two filtration Media into one housing, it removes contaminants longer than carbon-only systems can. The Travel Filter has an estimated capacity of 1,500 gallons or one year whichever comes first and is not refillable. Water flows through the filters at up to 3/4 gpm. Dimensions: Assembled: 7.25 inches tall x 5.5 in. wide. With spout removed from body (for traveling), filter is 7.25 tall x 2.75 inches wide.